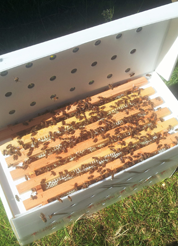 Why not buy your nuc of bees and ask us to put them into a hive for you? We take a deposit of £40 along with any extra options you order, the balance of £440 for the bees and hive are due on collection. The actual hive will made from Canadian cedar, they are the same as we sell in flat pack only yours will be assembled by our own carpenter. 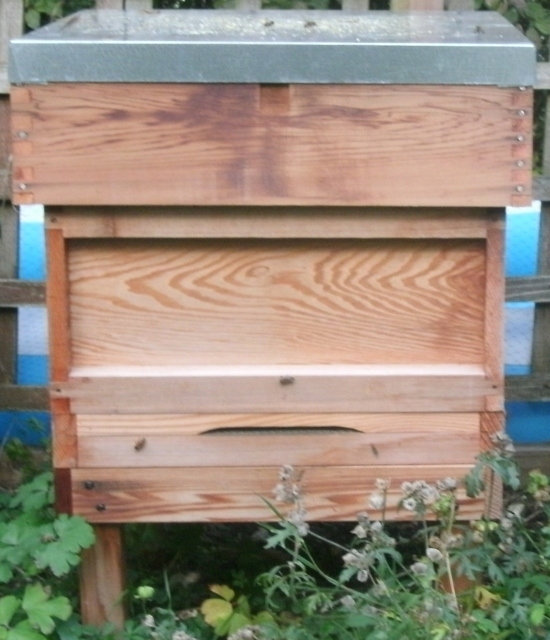 You can order other beekeeping supplies and equipment such as supers, assembled or flat, with or without frames to collect at the same time but please order these separately. The bees will be raised as a nucleus on 6 frames and will consist of 6 frames of bees, brood of all stages and food stores. The queen will be this years and she will be marked green for 2019. The nuc will be put into the hive a day before you are ready to collect to give the bees time to settle in, and the rest of the brood box will be filled up with 6 new frames and foundation; all frames are 14x12 self spacing. All our bees are treated for varroa and all nucs / colonies are fully inspected the day before they leave us. We have achieved our accreditation to the DASH scheme; Disease Accreditation Scheme for Honeybees, this is a an accreditation set up between the NBU (National Bee Unit) and the BFA (Bee Farmers Association). As with all our nucs, we comply with the guidelines set out by the NBU and Defra. Please note that these are collection only, although if you are not too far from us we may be able to organise delivery, the delivery cost would worked out by the mileage. The bees will be shut up the night before you collect and we will strap the hive with the ratchet strap so that it is safe for transporting. We request that all buyers register their new colonies with Beebase the National Bee Unit website. It is designed for beekeepers and also supports Defra, WAG and Scotland's Bee Health Programmes along with the Healthy Bees Plan, all of which help to protect and sustain our valuable national bee stocks. There are no costs involved with registering with Beebase, instead it gives you, the beekeeper, the security to know that should a bee health problem arise in your area, your local bee inspector will notify you about it, and if necessary come and inspect your colonies, free of charge.